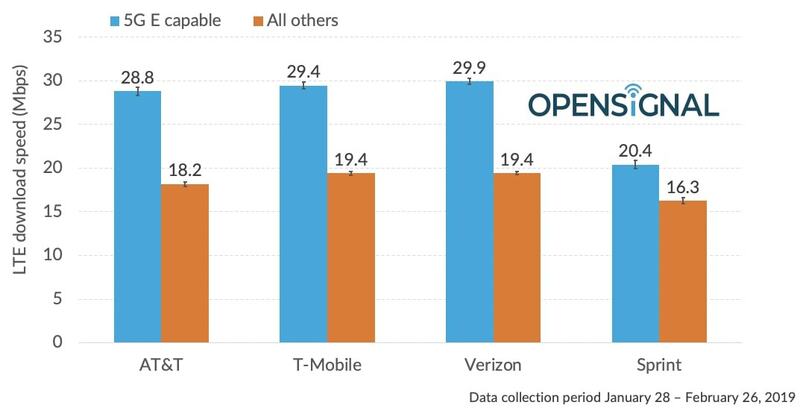 OpenSignal published its LTE speed findings today after compiling data from more than 1 million user-initiated speed tests. The results show that AT&T’s “5G E” phones get average speeds of 28.8Mbps, while T-Mobile’s get 29.4Mbps and Verizon’s get 29.9Mbps. Sprint struggles with the lowest Adanved LTE speeds, scoring an average of 20.4Mbps. Even though AT&T is using the same technology as T-Mobile and Verizon’s Advanced LTE networks, there are some benefits when your phone’s status bar shows it being on ‘5G E’ vs ‘LTE’ on AT&T. AT&T has told customers that 5G E brings customers 2x faster speeds than standard LTE but that doesn’t appear to be the case yet. Most carriers aren’t expected to rollout their true 5G networks until fall 2019. Even in those cases the rollout is expected to be pretty limited with most cities not getting 5G until 2020 at the earliest.